Do we have any responsibility for the well-being of future generations? According to Dr. Andrew Weaver this is the key question that must be considered when deciding whether to tackle the issue of global warming or not. Unfortunately science cannot provide an answer to the question. It must be decided by society as a whole. Are we willing to take the steps today to ensure that future generations are able to enjoy the same economic stability and ecological diversity that we currently enjoy? Dr. Weaver is a professor and Research Chair in climate modeling and analysis at the University of Victoria. He was the lead author in the United Nations Intergovernmental Panel on Climate Change and was the co-recipient of the Nobel Peace Prize in 2007. 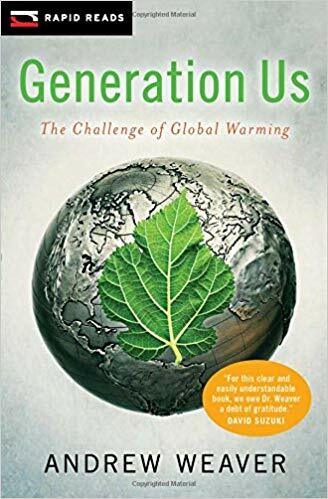 In this book Dr. Weaver clearly explains what global warming is, suggests reasons why we should care about the issue and offers some solutions to the problems that global warming creates. Solutions to the global warming problem generally fall into two categories: technological and behavioural. The technological problems may be large, but in truth, most of the solutions are readily available. They are just costly. Behavioural barriers are also present. Our current patterns of consumption are unsustainable. As a society we need to evolve from Generation Me to Generation Us. Classroom Connections: Generation Us is part of the Rapid Reads series from Orca Book Publishers. While the target audience for this series is adults, the books are written in a short, easy to read format (2.0 – 4.5 reading level). This means that Generation Us is readily accessible to most students in Grades 10 to 12. The book also provides teachers with a unique tool for introducing information circles and many opportunities to focus on the concept of transforming as a reading strategy. I would also recommend Generation Us as a resource for teachers looking for up to date information on the global warming issue. This review is from Canadian Teacher Magazine’s Mar/Apr 2012 issue.